As a writer, I have a certain love for the written word. Communication over the Internet has made my life what it is, and as much as I love Twitter and Facebook, part of me yearns for a simpler time. A time where I rattled out pages on my parents’ old electric typewriter; a time where I would send friends and family notes scrawled on physical paper by USPS mail. That’s why I was excited when I heard about Lettrs, a website and newly released iPhone app. 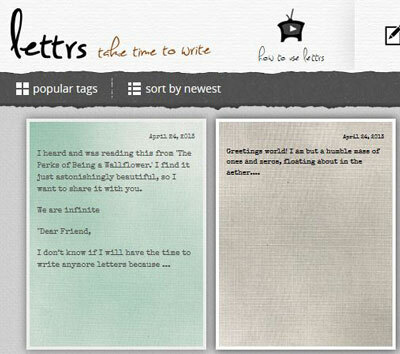 Created by written-word enthusiast Drew Bartkiewicz, Lettrs allows you to send long-form messages to a friend’s inbox or to a real-world mailbox, directly from your iPhone or computer. It's somewhat like the eCard sites and apps that now let you send cards via the USPS. 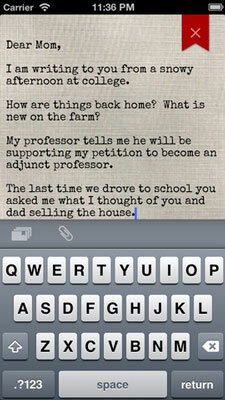 Lettrs contains a variety of fonts and a variety of stationery to create vintage, dated messages. You can send these lettrs via the cloud, but the shining feature of Lettrs is the ability to mail a physical letter direct from your smartphone. Your communiqué will be printed on scented linen paper, placed in a hand-addressed envelope, sealed with a wax stamp, and mailed from Collinsville, CT to the address of your choice. It’s an unnecessary level of complexity, but that’s what makes it just so darn cool. The app will set you back $2.99 in iTunes, but you get a lot of value for your money. Namely, each purchase of the app comes with five free USPS-delivered letters for you to use through Mother’s Day, May 12, 2013. And who is more deserving of a hand-addressed letter than dear ol’ Mom? After May 12, the cost of sending a physical lettr will range between $2 and $6. Delivery by email is free. My first batch of lettrs has yet to be delivered, but that won’t stop me from recommending the app. Get it now, and write a note to someone you love or grab a piece of paper, an envelope, and write the letter yourself. That 46-cent stamp is still the best bargain in the country.